In 1638 Perfilyev crossed from the Angara over the Ilim portage to the Lena River and went downstream as far as Olyokminsk. Returning, he sailed up the Vitim River into the area east of Lake Baikal (1640) where he heard reports of the Amur country. In 1641 Verkholensk was founded on the upper Lena. In 1643 Kurbat Ivanov went further up the Lena and became the first Russian to see Lake Baikal and Olkhon Island. Half his party under Skorokhodov remained on the lake, reached the Upper Angara at its northern tip and wintered on the Barguzin River on the northeast side. In 1644 Ivan Pokhabov went up the Angara to Baikal, becoming perhaps the first Russian to use this route which is difficult because of the rapids. He crossed the lake and explored the lower Selenge River. About 1647 he repeated the trip, obtained guides and visited a 'Tsetsen Khan' near Ulan Bator. In 1648 Ivan Galkin built an ostrog on the Barguzin River which became a center for eastward expansion. In 1652 Vasily Kolesnikov reported from Barguzin that one could reach the Amur country by following the Selenga, Uda and Khilok Rivers to the future sites of Chita and Nerchinsk. In 1653 Pyotr Beketov took Kolesnikov's route to Lake Irgen west of Chita and that winter his man Urasov founded Nerchinsk. Next spring he tried to occupy Nerchensk, but was forced by his men to join Stephanov on the Amur. Nerchinsk was destroyed by the local Tungus but restored in 1658. Since 1993, neutrino research has been conducted at the Baikal Deep Underwater Neutrino Telescope (BDUNT). 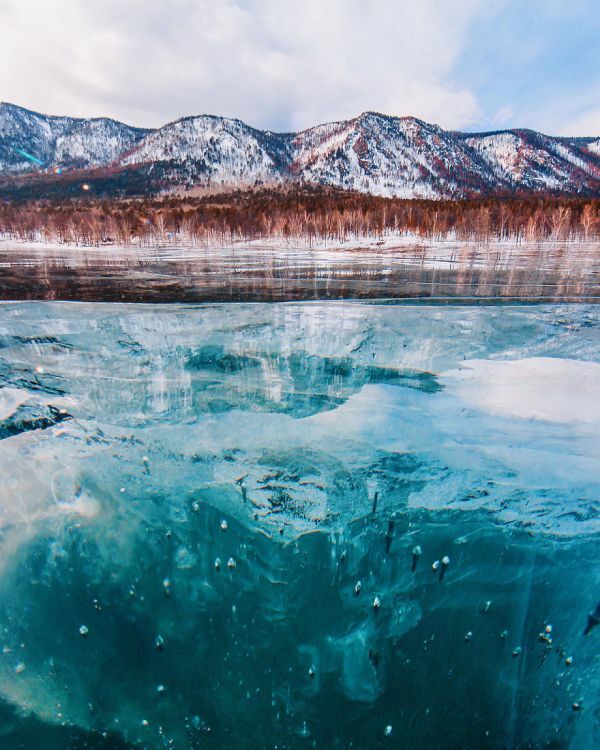 The Baikal Neutrino Telescope NT-200 is being deployed in Lake Baikal, 3.6 km (2.2 mi) from shore at a depth of 1.1 km (0.68 mi). It consists of 192 optical modules (OMs).